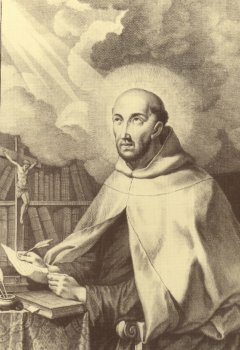 O my loving father St. John of the Cross, to imitate more perfectly our Lord, you generously renounced every consolation, even the spiritual; prayed to suffer and to be despised for God’s sake; and finally died suffering, happy to be condemned by men. Obtain for me the grace of abandonment to the Will of God that, placing all my joy and my hope in the passion of my Savior, I may at last rest eternally with you in His glory. Obtain for me also the special grace I ask through your intercession during this novena, if it be for the glory of God and for my salvation (make request). The essential message of St. John’s drawing of the crucifix is revealed by these verses. As these verses plainly express, Christ (the Bridegroom) wants to relieve the soul (the bride) of her suffering by taking it upon himself, and in doing so, restores the soul to the Father. 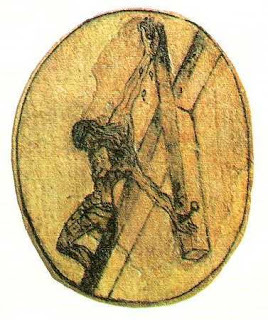 Thus, this small drawing reveals St. John’s specific relationship with the deity. St. John, through his artistic work, powerfully conveys the experience of his relationship with God to the viewer, thus allowing the interpreter direct access to his experience: the viewer of this work is truly the bride, who is looking on from above at the tortured Bridegroom. Compelled in the direction of the light source, the viewer is restored to the Father. The drawing, even more than these revealing verses, conveys the absolute suffering and sacrifice of Christ, expressing his intensity of love for the bride. While the bride experiences feelings of grief and separation, she also possesses a sense of hope because of the element of light that conveys the presence of the Father to whom the bride is restored. St. John’s work, though small and simple, is a complete expression unto itself. And yet, as we saw, the compositional elements of form and light established a complex relationship between Christ, the viewer, and the presence of God. Indeed, certain responses are clearly evoked by the work, whether or not the viewer is familiar with St. John’s writings, because it stands today as powerful imagery of divine love. The work commands our attention, as it ultimately reveals the crucifix as an expression of the intense love that the Bride groom has for the bride as she enters the inner life of God.